Figure 1. Canada goose (Branta canadensis). Photo by Stephen M. Vantassel. Explain key elements about the biology of Canada geese important for their control. Be able to explain the options for control of Canada geese to clients. Canada geese damage turf through their feeding and excrement. Parks, athletic fields, and golf courses are often damaged by goose flocks. Feathers and feces may also foul water, and excessive grazing may result in shoreline erosion. Geese also may become aggressive when nesting, and disturb area residents with their honking. Geese should be deterred from airport areas and flight paths for planes. All Canada geese (Branta canadensis), including resident flocks (non-migratory geese that may inhabit areas throughout the year), are protected by federal and state laws and regulations that govern the capture, handling, or killing of Canada geese, including disturbance of nests and eggs. Permits are required for most control activities other than hazing. Contact your state wildlife agency for more detailed information. Canada geese (Figure 1) are a valuable natural resource that provide recreation and enjoyment to bird watchers, hunters, and the general public. The “V” formation of a flock of flying Canada geese is a sign of the changing seasons. Geese that migrate may cause short-term damage, and mix with resident geese. In this module, we refer mostly to flocks of resident or local-breeding Canada geese. A Canada goose is black and tan with a large, white patch on each cheek. The male (gander) and female (goose) look similar, but males are slightly larger. Geese are 22 to 48 inches tall and weigh up to 24 pounds. Canada geese may charge or attack people and pets if nests are approached. They may inflict a painful bite or strike with the edge of a wing. People may be injured after slipping on goose droppings. Geese may create hazards on roads and cause traffic accidents in urban areas. They are a significant threat to public health and safety when near airports. Military and commercial aircraft have hit geese on takeoff, in the air, or during landing in thousands of cases. The most significant military aircraft disaster caused by birds occurred at Elmendorf Air Force Base in 1995, when an aircraft struck several Canada geese on take-off and crashed, killing 24 people. US Airways Flight 1549 was forced to land in the Hudson River after colliding with a flock of geese. Canada geese contaminate turf grasses with their feces, which can become a public health hazard in parks, athletic fields, golf courses, and residential areas. People should wash their hands before eating and change shoes before entering their homes or vehicles. Droppings from Canada geese may contain cryptosporidium, Giardia, toxoplasmosis, campylobacter, chlamydiosis, E. coli, listeria, Pasteurella multocida, salmonella, avian influenza, and encephalitic viruses. Although droppings of geese may carry several diseases, there are few cases of human illnesses that are attributed to goose feces. Geese form life-long pair bonds, but if a member of a pair dies, the other will mate again. Families migrate together, stay together in the winter, and return to the same area for nesting each year. The annual life cycle of a goose begins in late winter, when adult pairs return to nesting areas in late February or March, or as soon as ice melts. During a 1- to 2-week time span, a goose lays 5 to 6 eggs and incubates them for 4weeks during late March or April. Eggs hatch in late April or early May, depending on the location. Most geese begin breeding when they are 2 or 3 years old and nest every year for the rest of their lives. Resident geese may live more than 20 years in suburban areas. One female Canada goose has the potential to produce more than 50 young in her lifetime. Young geese (goslings) weigh 3 to 4 ounces when they hatch. Geese are precocial, and within 24 hours, hatchlings are able to swim. Geese hatch with their eyes open, covered in down, and can move about freely. In contrast, altricial birds, such as robins, are born helpless and need parental support. Geese aggressively defend their nests and may attack if approached. After hatching, families of geese may move up to 2 miles from nesting areas to brood-rearing areas, appearing suddenly at ponds bordered by lawns. Geese that are not breeding often remain nearby in large feeding flocks during the nesting season. A high percentage of non-breeding geese molt-migrate north into Canada in early June and spend the rest of the summer there. Canada geese build nests of twigs, grass, bark, leaves, and moss on the ground near water. Islands are preferred. At one urban pond in Nebraska where virtually no suitable habitat was available on the bank, geese nested on mats of floating, dead cattails. Geese also will nest on the tops of muskrat houses. Each year geese undergo an annual molt when they shed and re-grow their outer wing feathers. This occurs for a 4- to 5-week period after nesting, from mid-June through mid-July. Birds cannot fly when they are molting. The birds resume flight by late July. During the molt, geese congregate at ponds or lakes that provide a safe place to rest and feed. Severe conflicts with people often occur during the molt because geese concentrate on lawns next to water and cannot leave. Before molting, some geese without young travel hundreds of miles to favored areas for molting and migration, accounting for the disappearance or arrival of some local flocks early in June. After the molt and throughout the fall, geese gradually increase the distance of their feeding flights and are more likely to be found away from water. Resident Canada geese spend most of their lives in relatively small areas, although some travel hundreds of miles to areas for molting or to over-winter. Resident geese are distinct from the migratory populations that breed in northern Canada. Canada geese have a strong tendency to return to where they were hatched and use the same nesting and feeding sites year after year, making them difficult to eliminate once they become settled in an area. In addition, geese disperse from areas of higher concentration to lower concentration. Removal of geese from a particular pond will not guarantee that geese will not inhabit the pond during the same season or the following year. Canada geese prefer habitats with standing water less than 50° F and low sloping banks. Geese need access to growing grass for foraging. Mowed and fertilized lawns or turf areas near water are ideal habitats. Canada geese are herbivores. They eat grasses, a variety of terrestrial plants, aquatic plants, and occasionally agricultural crops such as corn, soybeans, and wheat. They feed during early morning and late afternoon. Canada geese communicate through body language, calls, and honking. 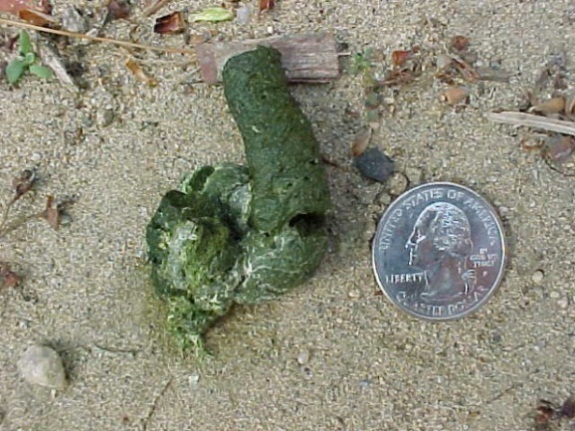 The droppings of Canada geese usually are tubular (Figure 2). Droppings are green when geese are eating grasses. Tracks are easy to find in soft soils or sand (Figure 3). Figure 2. Fresh dropping of a Canada goose. Photo by Stephen M. Vantassel. Figure 3. Track of a Canada goose. Image by Dee Ebbeka. Canada geese are particularly attracted to lawns and ponds near apartment complexes, houses, office areas, and golf courses. The birds can rapidly denude lawns, turning them into barren areas of dirt. Erosion may be a problem on pond banks. Canada geese eat crops such as corn, soybeans, wheat, rice, alfalfa, and grasses grown for lawns and golf courses. In some areas, crops that are sprouting can be severely damaged by grazing. Muddy fields can be compacted by trampling, which may result in reduced yields. Canada geese generally do not damage structures. Plant trees near pond edges to interfere with flight lines. To discourage geese from turf areas, plant fescues. Allow the grass to grow tall, and avoid fertilizing to reduce plant growth. Prohibit public feeding of geese. Create vegetative or stone barriers along shorelines. Where geese have established feeding or nesting patterns, such modifications will likely be marginally successful. Geese normally rest on open water or along shorelines. They tend to land and take off from open water. Where practical, construct a system of suspended wires over water to deny geese access to such areas. Single strands of 14-gauge wire, 80- to 100-pound-test monofilament line, or stainless-steel cable can be arranged in a grid with 10 to 15 feet between wires. Secure each wire so that it remains 12 to 18 inches above the water surface. Perimeter fences may be needed to keep geese from walking under the grid lines. To reduce the risk of birds flying into the wires, attach brightly colored rope, flagging, or other markers to make the wires more visible. Grid-wire systems are not practical for areas more than one acre, or for water that is used for swimming, fishing, or other types of recreation. Golf course ponds, reflecting pools, wastewater ponds, and newly-seeded lawns with limited access to the public may be suitable. Vandalism of grid wires may be a problem in public areas. Fences can be effective where geese land on water and walk onto adjacent lawns. Fences should be at least 30 inches tall and solidly constructed. Welded-wire fencing made with 2- x 4-inch mesh is durable and will last for many years. Less expensive plastic or nylon netting is effective but must be replaced more often. Fences work best during the summer molt, when geese are unable to fly and must walk between areas for feeding and resting. Fences, dense shrubbery, or other physical barriers installed close to the edge of the water are effective ways to control the movements of geese that are molting. Fences must completely enclose the site to be effective. Fences also may be used to block aggressive birds nesting near buildings or walkways. Fences around large open areas, such as athletic fields or ponds, have little effect on free-flying birds. Snow fence or erosion-control fabric may be used as a temporary barrier for geese that are molting. Fences made of 2 parallel monofilament fish lines (20-pound test), strung 6 and 12 inches above ground, and secured by stakes at 6-foot intervals, can work, but are less reliable. Successful control of geese has been reported with high-voltage electric fences. Use 2 strands of at least 17-gauge wire, 8 inches and 16 inches off the ground, respectively; or 3 strands at 5, 10, and 15 inches above the ground. Frightening devices may be used for short-term control of nuisance behaviors, before geese become habituated to a location. Do not use frightening devices when geese are nesting or flightless. Human-operated frightening devices tend to be more effective than stationary ones. Consider the timing of frightening activities, as geese may flee into traffic or aircraft. Locate stationary frightening devices where they will not become entangled or obstructed by tree branches or power lines. Devices may be subject to theft or vandalism in areas that are open to the public. Frequently relocate stationary devices to avoid acclimation by geese. Geese quickly learn whether something poses a real danger, and they quickly habituate to most devices. When the birds become habituated, the devices lose effectiveness. Visual devices may be used to deter geese if they are not already established on a site. Quietness is a key advantage of visual frightening devices, and makes them a suitable tool for use in populated areas. Visual frightening devices are not likely to be effective on suburban lawns where there are trees or other objects overhead, or in areas where geese have been established for years. Human effigies (e.g., scarecrows) or predators (Figure 4) attempt to portray visual threats to geese. Effigies with moving or flapping parts are more effective than non-moving ones. Reposition effigies every few days. Figure 4. A silhouette of a coyote may frighten geese. Photo by Stephen M. Vantassel. Flags or balloons can be placed on poles (6 feet or taller) in and around an area to be protected. Geese normally are reluctant to linger beneath an object hovering overhead. Flags can be made of 3- to 6-foot strips of 1-inch colored plastic tape, or 2- x 2-foot pieces of orange flagging. Balloons with large eye-spots and filled with helium are sold at some garden or party-supply stores. Several flags or balloons may be needed to protect each acre of open lawn. Mylar-style tape reflects sunlight to produce a flashing effect and may be an effective short-term deterrent for geese (Figure 5). 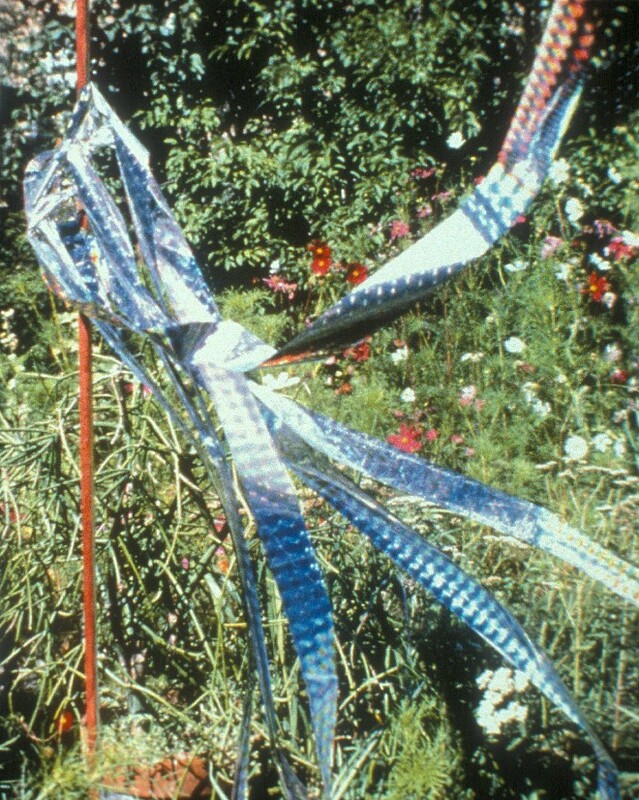 When the tape moves in the breeze, it pulsates and produces a humming sound that repels birds. Secure 6- x 30-inch strips of Mylar-style tape to 4-foot wooden stakes. Reinforce at the points of attachment to prevent tearing by the wind. Figure 5. Irri-tape® is Mylar® tape that can be attached to poles to scare geese. Photo by Bird-X, Inc.
Red and green lasers have proven effective for dispersing geese at night from lakes less than 20 acres in size. Use lasers as soon as darkness permits. Point lasers several yards in front of floating geese and slowly move the dot closer. Geese will be easier to move if lasers are used during several successive nights. Always keep the beam below the line of the horizon. Do not point the laser beam at buildings, people, or planes. High-powered spotlights can produce the same effect. Remote controlled boats have been successful for hazing geese (Figure 6). 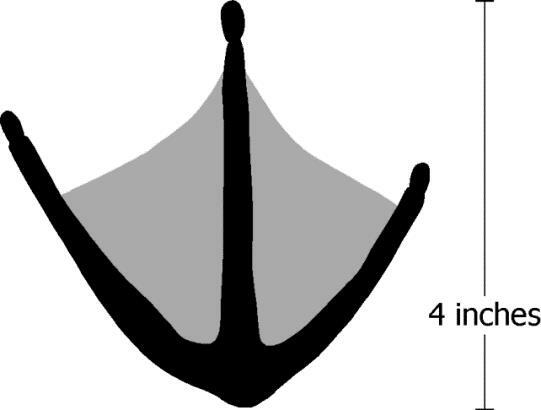 Select boats that are appropriate to the size of the water body. 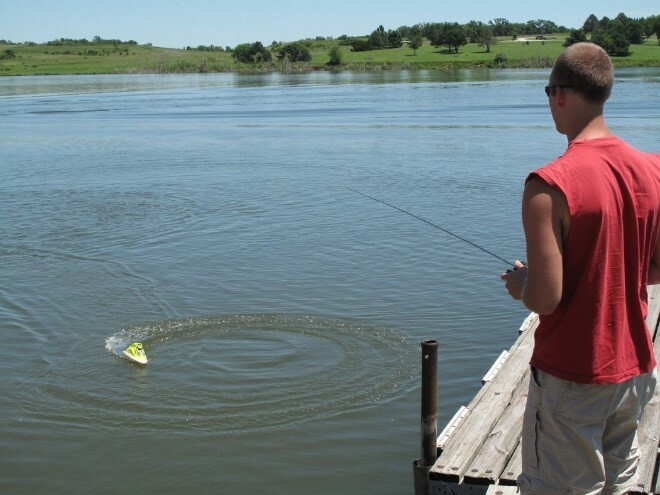 Boats work best when the water is calm on relatively small ponds that are 5 acres or less. Boats can be used in conjunction with pyrotechnics in some areas to increase effectiveness. Figure 6. Remote controlled motorboats can be an effective way to haze geese. Photo by Stephen M. Vantassel. Geese also may be discouraged from an area through the use of noisemakers. 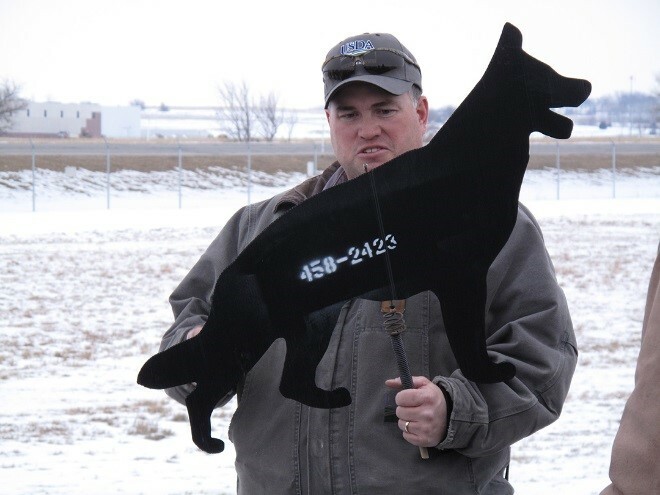 Noisemakers work best as preventive measures before geese become established in an area. At sites with a history of frequent use by geese and people, the birds may become acclimated in 1 to 2 weeks. Noisemakers may be prohibited or unsuitable in urban areas. Check with local law enforcement agencies about ordinances for noise control, codes for fire safety, or restrictions on possession and discharge of firearms before using any of these techniques. Obtain permits if necessary. In some areas, starter pistols are considered handguns, and their possession and use may be regulated. Where discharge of firearms is allowed, occasional shooting of geese can increase the effectiveness of noisemakers, as geese associate the sound with a real threat. Federal and state permits are needed to shoot geese outside of established hunting seasons. Pyrotechnics are special fireworks that are launched from a 12-gauge shotgun or starter pistol. Shell crackers are fired from a 12-gauge shotgun that project a firecracker up to 100 yards. Other devices, such as screamer sirens, bird-bangers, and whistle bombs, are fired into the air from a hand-held, 6-mm pistol launcher. They generally have a range of 25 to 50 yards. Read and follow safety instructions before using pyrotechnics. Propane cannons ignite propane gas to produce loud explosions at timed intervals. They are effective for migrant geese in agricultural fields, but are not suitable for residential or public areas. Long Range Acoustic Devices (LRAD) project a high decibel sound (up to 153 dB) from 200 to 300 yards. The closer the animal, the higher the decibel. The LRAD is useful for hazing birds off of surfaces such as airports, parks, and golf courses. Alarm and distress calls of Canada geese have been used to disperse geese from areas with varying results. 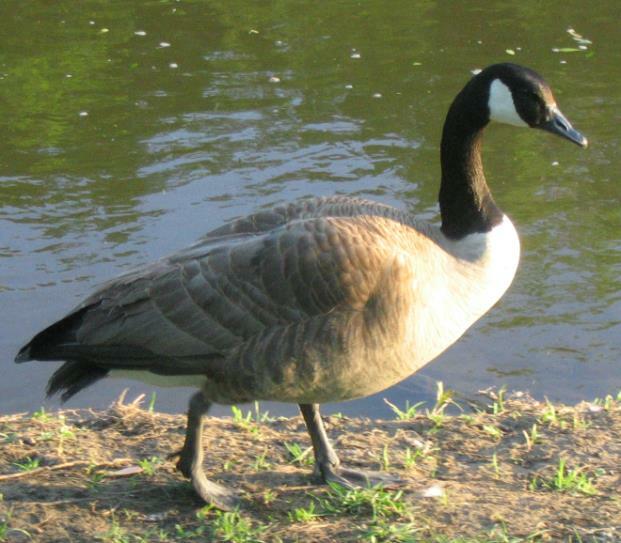 Geese may only move to another side of the pond and may acclimate to the calls, but a commercially-available device (Goose-Be-GoneTM) is purported to overcome some of the reported limitations. Trained dogs are very effective for controlling geese. Dogs are used to disperse geese from golf courses, parks, athletic fields, airports, and corporate properties. Breeds with instincts for herding, such as border collies, tend to work best. Hazing with dogs is most practical where the dog and handler are on-site at all times, or where daily service is available. The dogs must be closely supervised, and except where permitted, in compliance with local leash laws or park regulations. Initially, hazing must be done several times per day for several weeks, after which less frequent, regular patrols will be needed. Another approach is to allow dogs to roam freely in a fenced (above ground or “invisible” dog fence) area that is not open to the public, but this may be less effective. Geese do not acclimate to being chased by dogs. The use of dogs may not be practical near busy roads or where a property is divided into many small sections by physical barriers. Dogs cannot easily repel geese from large bodies of water, but may be able to keep geese off shorelines or beaches. Anthraquinone and methyl anthranilate are registered as repellents for the control of Canada geese feeding on turf. There are several commercial products and formulations available. Follow label directions for use. Repeated applications may be needed after mowing. If prevention of nesting fails (see Other Methods), eggs can be treated to inhibit hatching. Puncturing, shaking, freezing, or applying corn oil to all of the eggs in a nest will prevent hatching. After treatment, replace the eggs in the nest so the female will continue incubation until the nesting season is over. If the nest is destroyed or all the eggs are removed, the female likely will lay new eggs. Destruction of eggs reduces the number of geese that will be present on a site later in the year. Geese without young are easier to repel from a site after nesting season. If conducted on a large scale (throughout a town), treatment of eggs can help slow population growth and lead to stable numbers. Treatment of eggs may be necessary for 5 to 10 years before effects on local populations are evident. Federal and state regulations apply to any disturbance or treatment of Canada goose nests or eggs. Federal rules only require that people register on-line at: https://epermits.fws.gov/eRCGR before initiating the destruction of eggs. None are registered for the control of Canada geese. Federal and state agencies manage goose populations through regular waterfowl hunting seasons. However, due to firearm restrictions in suburban areas, hunting may not impact numbers of local-breeding geese. Depredation permits may be needed to reduce local flocks. Sharpshooting with special shotguns (e.g., Metrobarrels and subsonic rounds) may be more appropriate in urban areas. When geese are molting and therefore flightless, they can be rounded up and removed. During other times, geese may be captured with large nets fired by compressed air. Both of these techniques require specialized equipment, skills, and permits. They are best handled by professionals, so consult with your state wildlife agency. In spring, Canada geese usually return to the area where they hatched or previously nested. This often leads to an increase in the number of geese in areas that once had just a few birds. Local growth of populations may be controlled by preventing geese from successfully nesting. Although it is difficult to eliminate habitat, daily harassment in early spring may deter geese from nesting at a particular site. The geese may still nest nearby where they are not subject to harassment. Relocation of geese is not effective except in rescue situations. Geese that are translocated short distances (less than 50 miles) may return when they are able to fly. Adult geese are most likely to return, whereas goslings moved during the molt often will join a local flock, and remain in the area of release. Some geese that are translocated return to the location of capture by the following summer. Translocation may increase the risk of spreading diseases to wildlife in other areas. Federal permits are required to kill Canada geese. Geese are easily euthanized with carbon-dioxide. Geese also may be euthanized by cervical dislocation, which requires training, strength, and skill. Canada geese, NWCO, wildlife control, wildlife damage management.